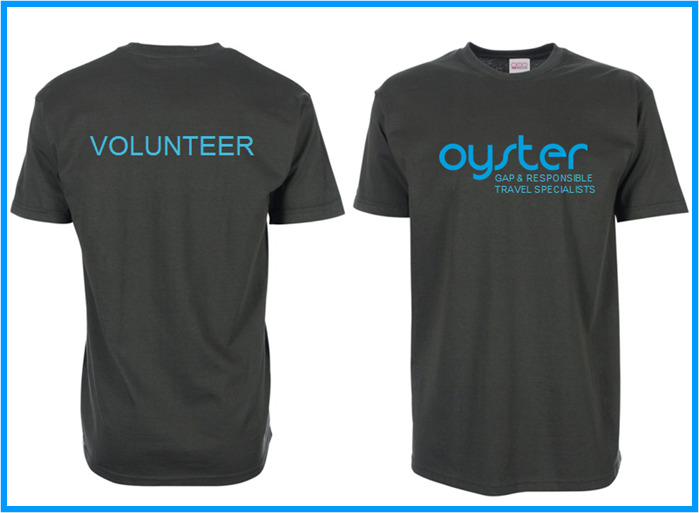 We are delighted to announce the launch of our Oyster volunteer t-shirts! Please note that at some projects bright colours cannot be warn as they can disturb the animals. For this reason the blue t-shirt option is not available on the following projects: South Africa Big 5 Experience, South Africa Game Ranger Course, South Africa Veterinary Internship, South Africa Lion Conservation, South Africa Elephant Conservation and Namibia Wild Elephant Conservation. Step 1: Choose your t-shirt and clearly state your choice on your booking form. Step 2: Once we receive your final payment, we will order your t-shirt. T-shirts are custom made and sent through a manufacturer so their delivery is out of our control. If your final payment is not paid by its due date, you may not receive your t-shirt before departure. Step 3: Your t-shirt will arrive within 15 – 30 days. Your t-shirt will be delivered to the address stated on your original application form (please ensure that you keep us up to date with your address details. We cannot be responsible if the t-shirt is sent to an old address). We look forward to seeing volunteer pictures with the t-shirts in action!